Among all the things you pack for a golf outing in Branson, your cell phone may be the most important. Yes, you still need your clubs, but make sure you have a phone handy because Branson’s golf courses offer incredible, photo-worthy views. A round of golf in Branson offers a variety of experiences designed to help you appreciate the natural beauty of the Missouri Ozarks. Peaks and valleys: Ozark Mountain topography means awesome elevation changes at Branson courses such as Ledgestone Country Club. 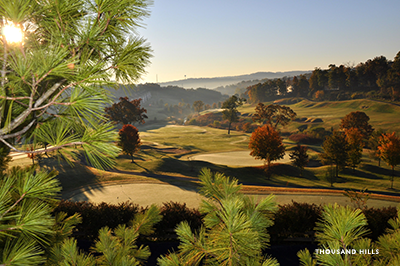 From the peaks, you’ll be able to see for miles and maybe let rip a majestic tee shot. In the valleys, the stunning mountain views are awe-inspiring and often test your shot-making skills. 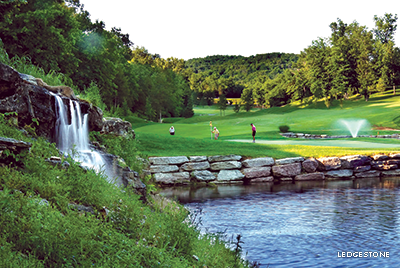 Water: Branson’s golf courses do a great job incorporating water as both a visual treat and a challenge to your round. Perhaps no place uses water better than Top of the Rock, a par 3 course with breathtaking views of Table Rock Lake. The course features a lake with an island green that is mesmerizing. Wildlife: With acres upon acres of forest in the area, it’s no wonder you’ll see wildlife, such as deer and turkey, when you play golf in Branson. What you might not expect is an encounter with buffalo. Such is the case at the aptly named Buffalo Ridge Springs Course (formerly Branson Creek) which is consistently rated as one of the top courses in the country and home to free-ranging buffalo. Resort features: Package your day of golf with an overnight stay or long weekend at one of Branson’s resorts to make the most of amenities such as swimming pools, tennis courts and fitness centers. The 18-hole, par-64 course at Thousand Hills Golf Resort is a great place to plan your golf getaway. Challenges: With changes in elevation, ample water features and rolling fairways, you’ll need to bring your “A game” when you play golf in Branson. At Branson Hills Golf Club (formerly Payne Stewart Golf Club) the challenge ratchets up on the back nine, where seven holes on the back nine play more than 400 yards when you play from the gold tees. It’s safe to say playing golf in Branson is as rewarding as it is intriguing. You’ll be sharing snapshots and selfies – and possibly trying to hide those eraser marks on your scorecard – for months after your round (or rounds) are finished. It’s time to tee it up and get in the swing when you golf in Branson.